Be generous. Some day, your life may depend on your compass. If you find a good compass for less than 80 EUR, be glad that it is so inexpensive. Even if you use the compass only for fun and learning, it is still much more fun to use a good compass than one that gets stuck frequently or is imprecise. On the other hand, high price does not necessarily indicate good quality! There are some astonishingly bad expensive compasses that make it hard to even take a bearing. This includes compasses where the needle has the same colour as the background, or where essential elements are obfuscated by others. I recommend you buy a compass with a global needle system. This means that it will work on the Northern and Southern hemisphere. In such compasses, the magnet can tilt independently of the needle, or the needle has enough leeway in the vertical direction so that it does not get stuck due to touching the capsule when subjected to different values of magnetic inclination around the world. As a very useful side-effect, such compasses therefore are also more tolerant to tilting while taking a bearing. Use graph paper to verify the alignment of all markings and scales on the compass. Make sure that the two ends of the needle can be clearly seen and distinguished also in weak light and red light, which is frequently used at night. Markings on the base plate or casing should be engraved, not simply painted. This ensures that the markings will survive all climate conditions and frequent use. The compass should be convenient to open, also when wearing gloves. 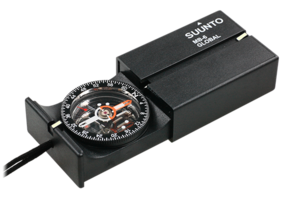 I recommend a compass like the Suunto MB-6 global for this reason: You can open it easily by pulling on a loop. A drawback of this design is that you need a separate ruler for serious measurements on a map. This is because the box is opaque and comparatively short. In contrast, the base plates of other models are larger and transparent so that you can see the map through the base plate when the compass is placed on the map. On the plus side though, the available markings are engraved on this very nice general-purpose compass. A mirror compass is useful also because the mirror can be used for signaling in emergency situations. A drawback of some mirror compass designs is the potential of small clanking noises when you are moving, which can announce your presence and scare animals away. Many good compasses feature a built-in inclinometer, also called clinometer, which you can use to measure slopes and heights. An inclinometer also lets you check whether you are on the same height as another object—such as the top of a distant mountain—and thus can help a lot for orientation. An included magnifying glass is an additional bonus, both for reading maps in weak light and for small surgeries like removing splinters. Take into account the current declination map of the earth's magnetic field. Some compasses feature adjustable declination corrections, but that is not strictly needed: You can also perform the very simple additions and subtractions yourself. Liquid damped compasses can freeze or develop bubbles in extreme temperatures, at higher altitude or with unsuitable damping fluids. Condensation and more erratic needle behaviour are common problems with other types of compasses.